How to scan your website or any other site for malware/viruses | "DZUB-NON TRUL-PAR"
The down side of this site is that you will be required to wait some time(depending on the load of the service) for the scan to be completed. At this moment (http://www.siteadvisor.com/sites/radoveanu.ro/summary/) the results for my site where not available. 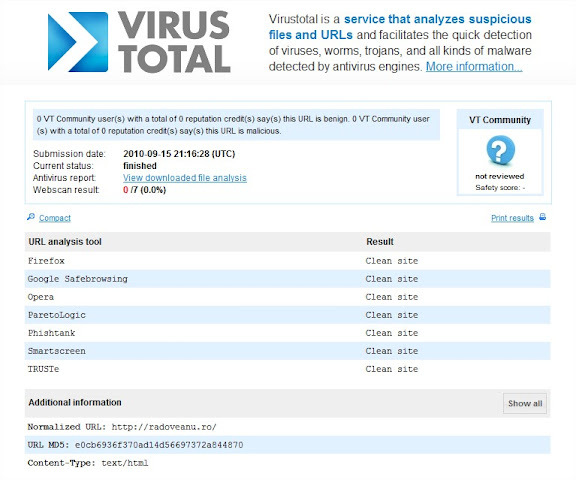 Virus total has another approach: It will scan the url against some “URL analysis tool” like Google, Firefox or Opera and then open another window that will scan the index.html from your site against all the antivirus engines at their disposal. It has the speed that you are used to and a new community in the background that could save precious time on your web journeys. Worth mentioning is also the AVG LinkScanner http://www.avg.com.au/resources/web-page-scanner/ but I was unable to test the service due to an error.